The adjustment to Triple-A has been a breeze so far for Dylan Cease. 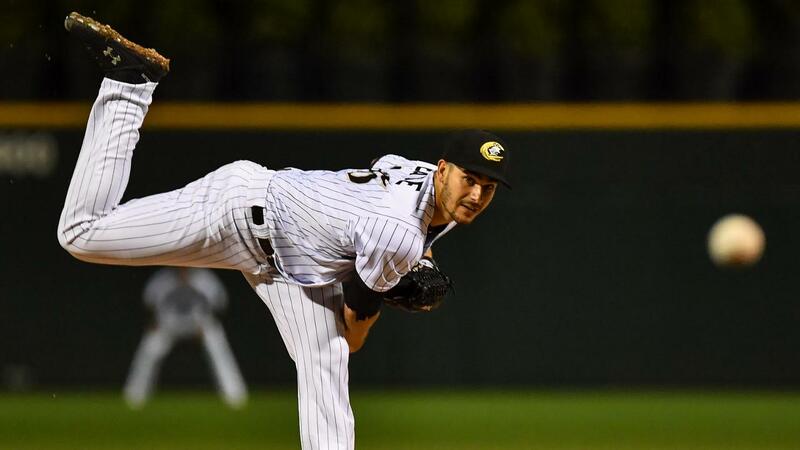 The third-ranked White Sox prospect ran his scoreless streak to 10 innings straight to start the season after allowing two hits over five frames Sunday in Triple-A Charlotte's 3-0 victory over Indianapolis at Victory Field. He struck out four and walked one. Safe to say, Cease is feeling confident about his abilities on the mound. "I definitely feel like I could compete in the Major Leagues right now," he told The Chicago Sun-Times. But the 23-year-old righty remains focused on his current task at hand. "But [a callup] is really not something I focus on at all," Cease told the Sun-Times. "The more I work on my pitches and execute what I'm doing, the more good things will happen. I try not to get ahead of myself and stay in the process." MLB.com's No. 21 overall prospect was in command at both the Class A Advanced and Double-A levels last season. In 23 starts, Cease went 12-2 with a 2.40 ERA while striking out 160. He allowed 33 earned runs on 82 hits with batters hitting .189 against him en route to being named an MiLB.com Organization All-Star after the season. In his first start in the International League on April 9, Cease held Norfolk scoreless for five innings. He gave up three hits without a walk and struck out five in the Knights' 4-0 win over the Tides. A sixth-round pick in the 2014 Draft by the Cubs, the Georgia native was involved in the 2017 trade that brought White Sox No. 1 prospect Eloy Jimenez and first baseman Matt Rose to the South Side of the Windy City in exchange for southpaw Jose Quintana. Cease's dominance on the mound has caught the attention of White Sox director of player personnel Chris Getz. "He's got good stuff, he can command four pitches and he's just a poised individual, so those are pretty good ingredients for success at any level," he told the Sun-Times. After Cease's exit Sunday, White Sox No. 25 prospect Caleb Frare struck out two during a hitless sixth. Righty Carson Fulmer struck out four and gave up a hit in two innings. Righty Evan Marshall picked up his first save after fanning two in a perfect ninth. Ryan Goins and Matt Skole accounted for the Knights' offense with home runs.